My brother, JT, was born in 1914 and grew up in a vastly different environment from that of today. Now, in his 88th year he often reminisces about ordinary events of his childhood that seem implausible in today’s fast-paced world. I like to hear his stories and feel that they should be recorded for other family members to enjoy. Our father was an excellent judge of horseflesh. He loved horses and bought and sold and traded them all of his life. As a child I can remember attending many a horse show with the family. Daddy wasn’t much interested in racehorses but loved best to see a horse put through its gaits. We watched Tennessee Walking Horses, five-gaited American Saddle Horses and Harness Horses because they kept their gait when racing. We always attended the horseshow at the Tennessee State Fair and out of a dozen entries in the ring in a given category Daddy would say, “Watch number blank and number blank, one of them will win”. He would invariably be right. I remember vividly the night that Midnight Sun took all honors in the Walking Horse Class. Tuck on Roy was Robert Moore and Daddy often traded with him. Robert Moore’s pasture for his horses was where the present day Executive Inn, Shoney’s Restaurant, and the shopping center beyond them, are located. The horses and the grass are gone but the land made the family very wealthy. Daddy bought his first car in 1921 and it was in the early twenties that while in Springfield he bought a horse and a pony, probably from Robert Moore. JT and Tuck Jr. were with him and as he had no other way to get them home, he told them to ride them to Adairville. JT rode the full size horse and Tuck rode the pony. They started out late in the afternoon. The road was, of course, unpaved, which made traveling by horse easier, and the boys had it completely to themselves. They were about half way home before they saw another human being. Some roadwork was in progress at that point and a man that they knew whose name was Punch McGoldrich was spending the night there guarding the big wagons and equipment that was being used in the roadwork. They stopped and visited for a while with Punch and then continued on their way. They arrived home at about ten o’clock that night. They had traveled the twelve miles from Springfield without meeting a single car or buggy and seeing only one person during the entire trip. Daddy sold the horse fairly soon after that, but kept the pony. It was Tuck’s pony and he loved him. 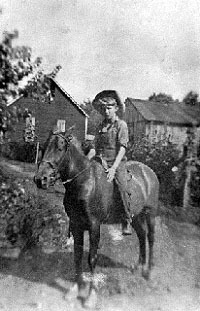 He was a little sorrel named Roy and JT says that he could “blow out the wind with his trotting”. Daddy had one brother who never married. His name was Ulysses Gold Tinsley and we called him Uncle Lys. As a child he had had a bad case of measles that had settled in his eyes and he was almost blind. He spent most of his time with his oldest sister, Aunt Roma and her family, but he visited among the other family members quite often. Once when Daddy had gone down to Dawson Springs he bought a milk cow and Uncle Lys was to drive it home to Adairville. Uncle Lys would stop wherever he ended up when the day was over, and spend the night with people who lived along the way. One night he stopped at a fellow’s house who was a bachelor and who liked to tip the jug. They got roaring drunk and the cow wandered off and was nowhere to be seen the next morning. Uncle Lys lost a whole day looking for the cow but finally found and retrieved her. He reached Adairville a couple of days later having been on the road a week. The boys liked for Uncle Lys to come as he had done quite a bit of traveling and had tales to tell. Their evening entertainment in those days was to sit by the fire, pop popcorn and listen to Mama read. They loved to hear Zane Grey’s books and JT particularly remembers her reading from a different author, “Slow Train through Arkansas” which was full of laughs. Their other entertainment was listening to the victrola. It was an upright, about five feet tall with a big horn just below the turntable. The records were about a half an inch thick and were jigs, reels, and popular music of the time. One of my favorites was called “You’re in Kentucky as sure as you’re Born”. It was JT and Tuck’s job to change the records and wind it up. They really disliked this duty. It was a constant interruption. Stop! Jump up and turn the record over, wind it up and then all too soon, stop! Jump up and change the record and wind it up again. What a relief it was when the radio came along. Their job was much easier then. Once a week they took it to Mr. Clark Harper who had a battery charger that kept all the radios in town going. JT and Tuck had ours charged every Friday. That was so the reception would be nice and strong for the weekend. Radios were not being run by electric power yet. Cars were still being cranked. In 1926 Daddy bought our first car that was operated by a battery. Cranking the car was hazardous duty. When the motor caught the car would jump toward the one cranking it and he had to jump out of the way. It was not uncommon for a cranker to end up with a broken arm. Electricity came to Adairville in the early twenties, right after World War I. The sub station was near where the water treatment plant is now, down below our house. Mr. Clark Harper and Mr. Hadley Hampton ran it. Daddy had the inside of our house wired soon afterwards. At a later date when Mike Fitzsimmons was visiting us from Paducah he wired our front porch, the smoke house, and the barn.